WCCLS is pleased to partner with the Housing Authority of Washington County (HAWC). 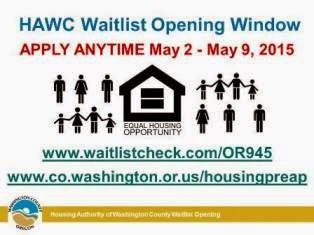 HAWC will be taking applications for their Section 8 Housing Choice Voucher and Public Housing waitlists from May 2nd to May 9th. If applicants do not have Internet access, they can use the public computers at WCCLS member libraries to submit an application online. In addition, staff from the Housing Authority staff will be at WCCLS libraries and PCC at scheduled times throughout the week to help people apply. To learn about the waitlist opening, visit www.co.washington.or.us/housingpreap. This site includes a link to the application, as well as days and times when Housing staff will help the public at WCCLS libraries. HAWC plays an important role in providing affordable housing in Washington County. WCCLS is glad to have the opportunity to assist HAWC in this critical service to our community.